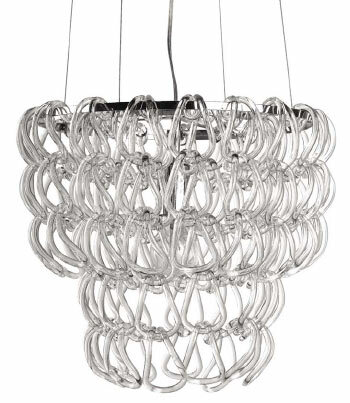 13.5" Cristallo Petit Chandelier Crystal Hooks to illuminate light in your room. Giogali style fixture designed by Angelo Mangiarotti. The Cristallo Petit Chandelier possesses great design and great quality throughout at a fraction of the cost of comparable fixtures made of Murano Glass or Crystal!! The Cristallo Petit Chandelier comes with individual crystal hooks which are placed over 1 single tier. Inside the light illuminates from 1 individual socket with a max 100W standard incandescent bulb. A silver canopy is supplied to hang the fixture at your desired height. The frame is made from chrome steel.